I have been a user since mid-2008 of the Neilpryde MXT system. Now it is about time to put a review about the Neilpryde power M-base. The MXT extender review and Review with comments are really positive from me and I still 99% agree with these reviews. I have bought 2 Power M-Base, average per session I do >2 hours action. Since mid-2008 I did about 80-100 sessions per year. In almost 2 years this would be +-400 hours. 200 hours lifespan, now at first I thought "this claim is again an insurance type of joke from neilpryde, like don't use your NP RS:Racing above 25kn wind". But it is reality, the power M-base has to be replaced totally after 200-250 hours in my case, I did 300 hours but a few plastic parts are worn out. At 200 hours I wanted to replace the M-base, but in the shop I simply chose to do some more time on the first base (after seeing the price) and from my point of view there was still some safety. I haven't broken a power M-base ever, let this be clear! Actually I never experienced decrease of performance with some movement in the base, this is the main reason I really need to test the North Shox.XTR. Please let this be clear, power M-base + MXT extender is still one of the best product to transfer the sail's power to the board. Only I don't believe it is intended/needed to replace the power M-base everytime. My suggestion would be to Neilpryde: Leave the MXT as it is but replace the Power M-base for a more durable design. A more durable design would fit the Neilpryde brand better. Longer lifespan would also be better for the environment. Replacing the tendon every year is a good thing, nothing more should be necessary for at least 1000 hours. 1000 hours is nothing, even crappy cars last 1000 hours ;). At least I think it should last 1000 hours, including some small maintenance. 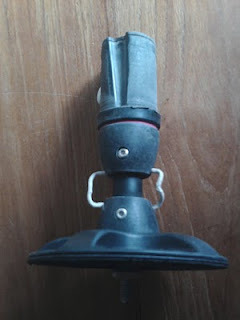 Tip for all speedsurfingblog readers: I saw some selling the power M-base (with or without the MXT extender), my advice don't buy the power M-base used!!!! I wouldn't even dare to sell mine. I once surfed the Gouwzee with a wind direction 10 degrees more east than you depict in your writing. It was easy to surf, relaxed. A local told me that with most wind directions at the Gouwzee it is more difficult surfing than surfing at the Amstelmeer. Anyhow my once experience at the Gouwzee told me that with that wind deriction it was easier surfing than southe-west at the AMstelmeer. Southwest at the Amstelmeer can be very chaotic!! I broke a Neil Pryde Mast last week.The screw simply broke above the plate and the board was seperated from the rig. Now I will check if Neil Pryde will replace the base, even if it is from 2008 and about 100 hours of use. I also broke the Neil Pryde RDM extension and will also try to get a replacement. I keep you informed about the reaction of Neil Pryde. Hi. Do you have any suggestions for what tools I would need to service the mxt base. To tighten the connection between top part and top plastic piece where tendon is fastened.